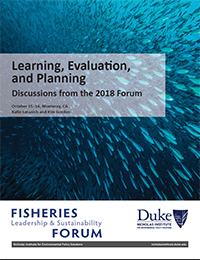 The 2018 Forum convened by the Fisheries Leadership & Sustainability Forum (Fisheries Forum) explored the role of learning, evaluation, and planning in the regional fishery management council process. In the increasingly complex federal fisheries management process, councils must use their finite resources strategically to achieve their goals and objectives. The Forum explored methods for instilling strategy into the council process through short-term planning, setting goals and objectives, evaluation, and long-term planning. Discussions also examined opportunities to build strategic capacity at the individual and institutional levels. Many states attempt to increase the economic benefits generated from their fish resources through foreign fishing arrangements that can be characterized as trades in fishing services. 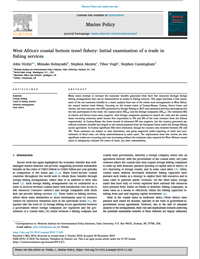 This paper provides a first assessment of the net economic benefits in a static analysis from one of the oldest such arrangements in West Africa: the coastal bottom trawl fishery. Focusing on the coastal states of Guinea-Bissau, Guinea, Sierra Leone and Liberia, the total resource rent (RR) generated by foreign fishing in 2015 was estimated and then decomposed for the two participants in the trade: the coastal states (RRCS) and the foreign companies (RRFC). The implications from this review are that significant trades are occurring and even increasing without the minimum data required for West African coastal states to adequately evaluate the terms of trade, nor their sustainability. Ecosystem service maps are instrumental for the assessment and communication of the costs and benefits of human-nature interactions. 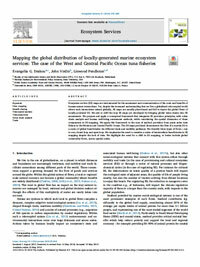 This article in the journal Ecosystem Services proposes an integrated way of assessing and mapping global flows of marine ecosystem services. It proposes a conceptual framework that integrates ecosystem service provision principles with value chain analysis and human well-being assessment methods, while considering the spatial dimension of these components in ecosystem service mapping. It applies this framework to the case of seafood provision from purse seine tuna fisheries in the Western and Central Pacific Ocean. 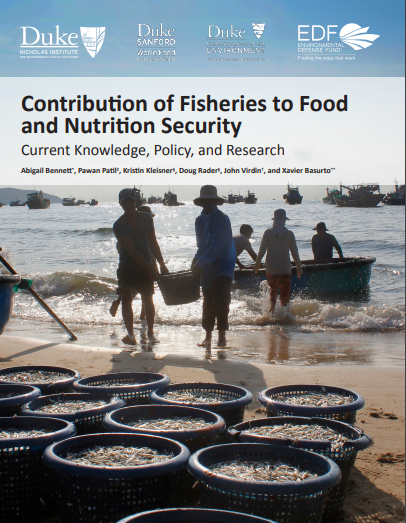 In the context of the recently agreed-on United Nations 2030 Agenda for Sustainable Development, which includes the goal to end hunger, achieve food security, and improve nutrition, this report synthesizes the current understanding of capture fisheries’ contributions to food and nutrition security and explores drivers of those contributions. Further, the report examines how ensuring the sustainability of these fisheries—they provide nearly one-fifth of the average per capita animal protein intake for more than 3.1 billion people—and recognizing any synergies between conservation and food security objectives could be important considerations during policy development. Many fisheries around the world are considered an economically underperforming asset—providing lower returns than they could be if more sustainably managed. This report, co-authored by researchers at the Environmental Defense Fund and the Nicholas Institute for Environmental Policy Solutions, introduces the idea of a blended capital approach to fill the all-too-common finance gap that may hamper recovery of many fisheries. 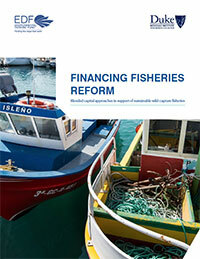 The report describes the categories of investment required to attain fisheries sustainability at each stage of the recovery process, identifies where within this framework there is likely to be the biggest funding gap, and suggests possible approaches for philanthropic and public capital to leverage private capital to help fill the gap. Small-scale fisheries play an important role in contributing to food security, nutrition, livelihoods and local and national economies. However, there is often limited data and information available on their contributions, and hence small scale fisheries tend to be overlooked and marginalized in policy processes, leading to low levels of support for the sector. 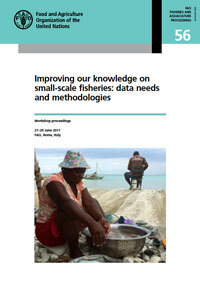 This proceedings provides a summary of the presentations, discussions, conclusions and recommendations of the “Workshop on Improving our Knowledge on Small-Scale Fisheries: Data Needs and Methodologies,” held at the Food and Agriculture Organization of the United Nations headquarters in Rome, Italy, in June 2017. Through the workshop, it was determined that a comprehensive new study to illuminate the hidden contributions of small-scale fisheries to the three dimensions of sustainable development, as well as identification of key threats to these contributions was needed. The health, development, and environment sectors increasingly realize that they cannot achieve their respective goals by acting in isolation. Yet, as they pivot to act collectively, they face challenges in finding and interpreting evidence on sectoral interrelationships, and thus in developing effective evidence-based responses. Each sector already uses some form of evidence-based research, design, and action planning, but methods vary, and ideas about the strength of evidence differ, creating stumbling blocks in the way of cross-sector impact. A new initiative, called the Bridge Collaborative, sets out to spark cross-sector problem solving by developing common approaches that the three sectors could agree to and use. The collaborative has focused on two linked areas of practice that could unlock cross sector collaboration: results chains and evaluation of supporting evidence. This document captures a set of principles identified and used by the collaborative, along with detailed guidance for creating comparable results chains across sectors and evaluating evidence from multiple disciplines in common terms. Ongoing economic, technological, and demographic shifts are altering the nature of today’s major, global issues and challenging us to rethink our past and current approaches to solving them. As our planet becomes more populated and prosperous, the demand for finite resources—such as water, energy, and food—are increasing rapidly. These trends escalate the urgency to find new ways of addressing persistent and growing challenges. But current research and policy systems inhibit integrated approaches to problem solving. Too often, the health, environment, and development sectors work independently setting narrowly defined objectives and failing to consider consequences outside of their own sector. 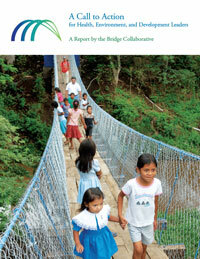 A Call to Action for Health, Environment, and Development Leaders and a companion paper Bridge Collaborative Practitioner’s Guide: Principles and Guidance for Cross-sector Action Planning and Evidence Evaluation are aimed at increasing cross-sectoral focused on shared evidence. 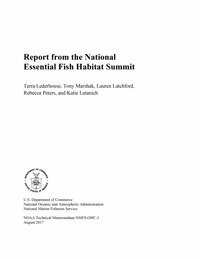 In recognition of the twentieth anniversary of the inclusion of essential fish habitat (EFH) provisions into the Magnuson-Stevens Fishery Conservation and Management Act (MSA), the National Marine Fisheries Service (NOAA Fisheries), regional fishery management councils, and their partners convened the National EFH Summit in May 2016. Held in Annapolis, Maryland, this three-day participatory working meeting was facilitated by the Fisheries Leadership and Sustainability Forum and was organized by council and NOAA Fisheries staff and leadership. The goal of this summit was to bring together council and NOAA Fisheries habitat experts to assess and identify opportunities, challenges, and successful approaches for effective implementation of the MSA-EFH authorities across regions, and in a changing environment. 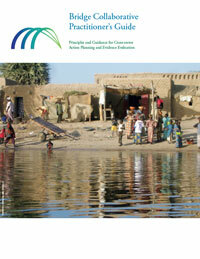 This report details seven emergent themes.